A little over a half dozen years ago I was starting to get serious about knitting and for Christmas in an effort to better keep track of and take care of my double pointed needles, I decided to ask for a good double-pointed needle case. Still relatively new to all things knitting and with a tight budget I really wanted to get a good quality one that would be functional, long-lasting, and — of course — pretty. I ended up asking for a della Q DPN case because I loved the classic look and rave reviews of their quality. My in-laws graciously fulfilled my wish. Although I don’t believe the company still makes the design, I still have and use that first della Q case regularly. And I was so impressed with its quality that over the years I’ve added a Double Interchangeable Needle Case to hold my interchangeable sets as well as a Lily Solely Socks case to hold my Signature DPNs. The only one that shows the very tiniest bit of wear is the interchangeable case because I have not 2, but 3 sets of interchangeable sets in it and have used it multiple times each week for the last five years. Even being over-filled and frequently used the wear is minor — it’s really quite astounding. These cases are really well made with quality materials. Of that, I can personally attest without any doubt. 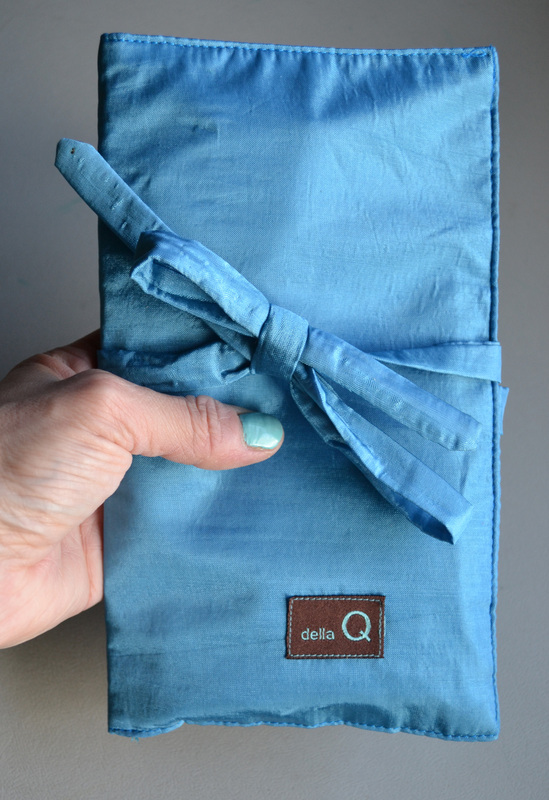 When I was asked if I’d want to review a product for della Q this spring, of course I was more than happy to try out a new product and share my experience with this company’s wonderful cases. I also took the opportunity to read a bit about the company. After all, I know they made good quality, beautiful accessories for knitters and crocheters. I know the products are developed and improved based on customer feedback and input. But what about the company itself? Well, della Q has been in business for over a decade and is founded and run by a woman named Della. Della wears all the hats in the company, doing everything from design to marketing. For the majority of her years at the helm of della Q she’s worked with the the same supplier in Vietnam. She visits the workshop to make sure the sewists who hand sew all the della Q bags are treated well. It’s also worth noting that Della donates a portion of her profits each year go to Mekong Quilts which is an organization that trains low-income and rural Vietnamese women in the art of quilting. It’s always so heartwarming to hear that a company you love puts forth the effort to make the world a little better, don’ you think? 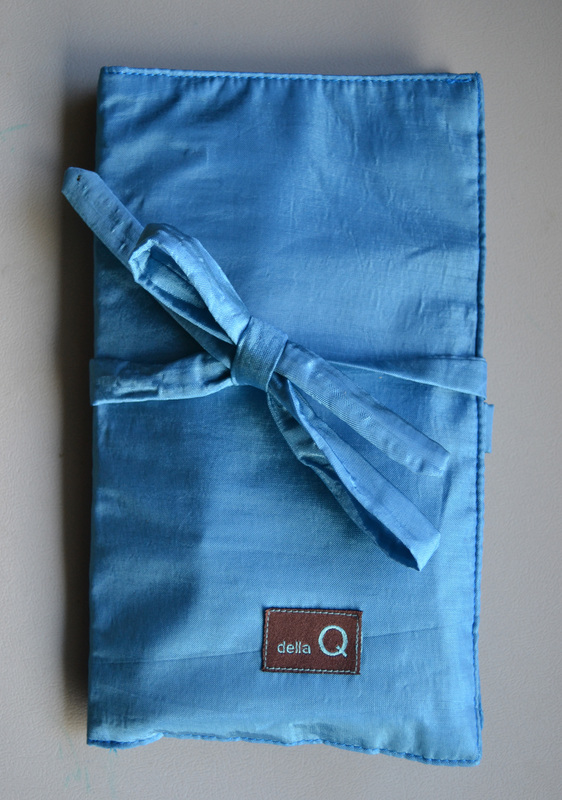 Knowing all this, I’d like to introduce you to the newest della Q accessory in my knitting bag: the Travel Wallet. Mine is in the beautiful Ocean color — we all know I love all things blue and this fits right in with all my knitting gear. When you flip it open, it obvious this case is very versatile. 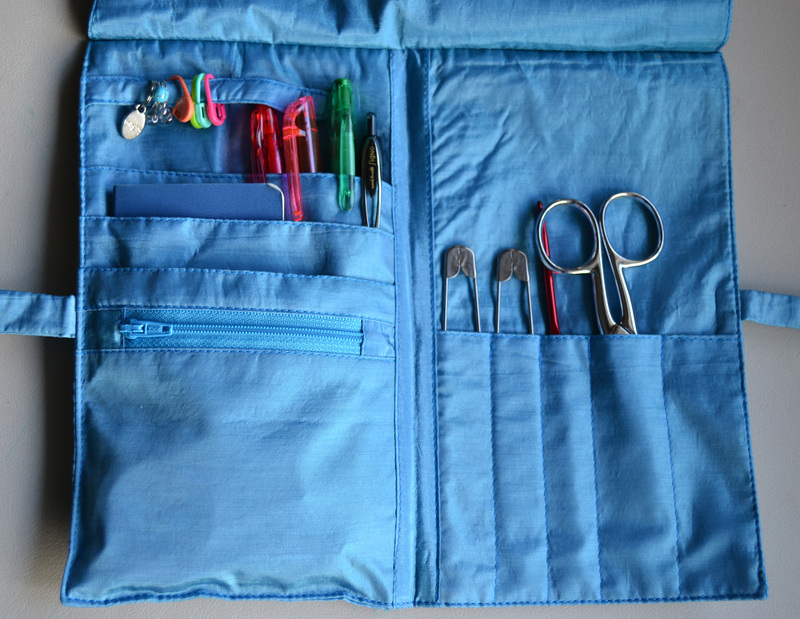 You could tuck a couple sets of needles in it for a trip along with your essential knitting tools, or you could do what I’ve done here and set up a comprehensive travel kit. 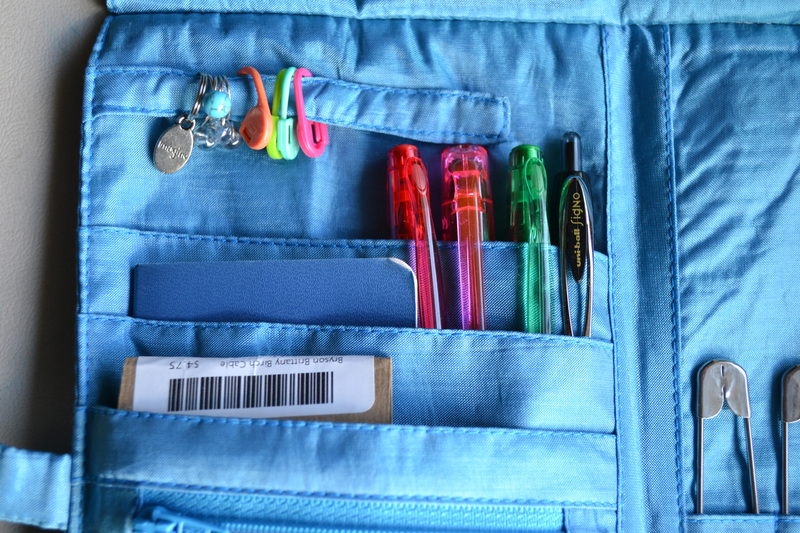 On this side I’ve added a cache of stitch markers to the clever snap band at the top, a highlighter and some multi-colored pens, a little notebook for notes, a kit of cable needles, and in the zippered pouch I have a tape measure, a small roll of highlighter tape, a tapestry needle, and a Handi-Tool. On the other side, I have a couple large stitch holders, a crochet hook, and some scissors. You could easily tuck in a set or two of DPNs or even some interchangeable or circle needles if it better suited your projects. The fold down flap at the top insures that nothing will fall out accidentally. All this and in a case that is quite small. 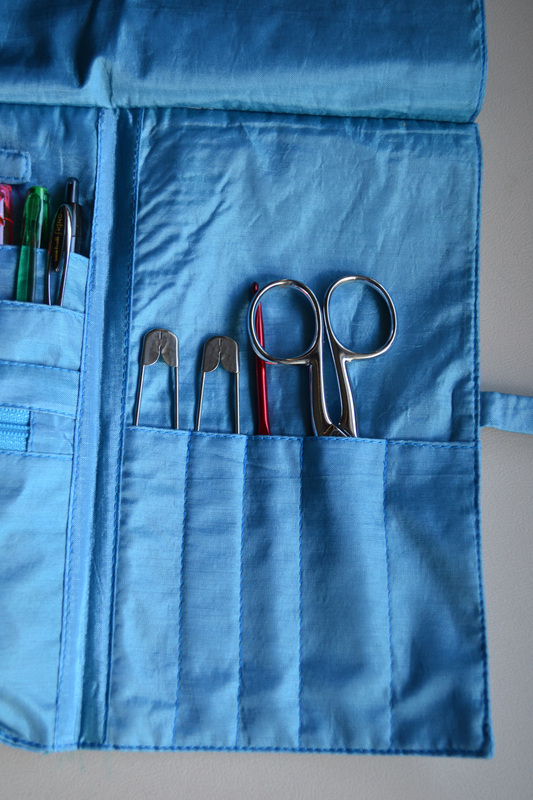 This case will easily be popped into my tote or knitting project bag whenever I’m on the go and — voila! — I’ll have everything I need at my fingertips. It’s hard to see exactly how incredible the hand stitching is in a photograph, but trust me when I saw I can hardly believe these are hand sewn. Partly because they are so insanely sturdy and partly because the stitches are so neat and tidy & straight. This little case really is a wonder, just like the other della Q cases in my collection. 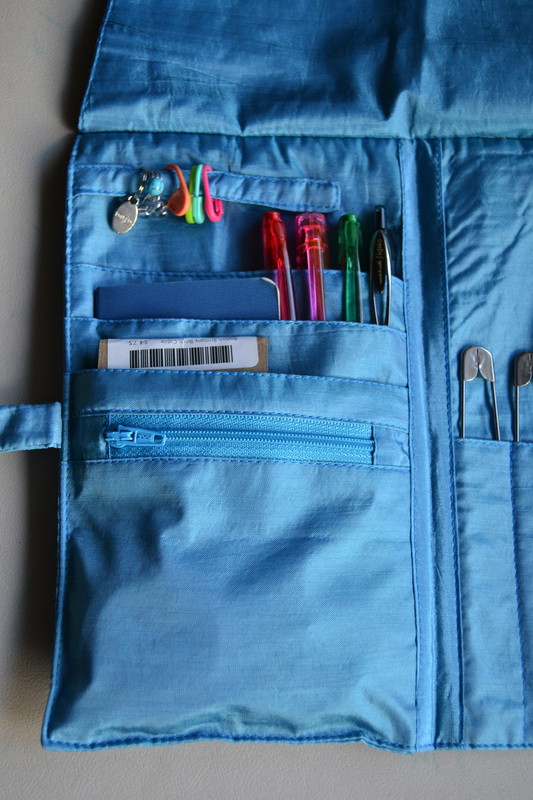 Obviously I’ve been really happy with my della Q cases and I’d venture to guess the perfect case to help you organize your needles or supplies or projects is out there. Crochet hook cases, straight knitting needles cases, interchangeable cases, circular cases, DPN cases, yarn caddies, combination cases, and project bags — there is such a great selection from della Q. I hope you’ll check it out for yourself! Entirely unrelated, I love your large stitch holders! Where did you get them?